In large bowl, mix apples, 1/2 cup of the caramel topping, the sugar and cinnamon. Spread evenly in baking dish. In 1-quart saucepan, heat butter over medium heat 6 to 8 minutes, stirring frequently, until golden brown. Pour into large bowl; cool 5 minutes. Stir cookie mix and egg into browned butter with wooden spoon until soft dough forms. Spoon dough by tablespoonfuls evenly over top of apple mixture. Bake 30 to 35 minutes or until cookies are golden brown and edges of fruit filling are bubbly. Cool 15 minutes. Drizzle top with remaining 1/2 cup caramel topping, and serve. 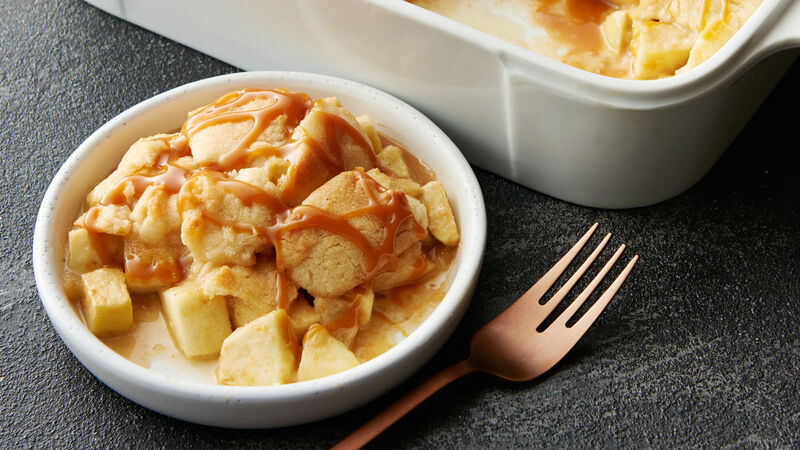 The Granny Smith apples are a sweet-tart variety that holds its shape well when baked and won’t be overly sweet when paired with the caramel topping. A dollop of whipped cream would make a lovely garnish to this dessert.